Canning Town’s rising Cruiserweight star Wadi ‘Machoman’ Camacho makes his fifth professional outing this coming Saturday, at the Eddie Hearn promoted ‘London Calling’ event at Alexandra Palace, headlined by Lee ‘Lights Out’ Purdy versus unbeaten Argentinean Gumersindo Lucas Carrasco for the vacant IBF International Welterweight title. Wadi’s opponent on Saturday will be Long Eaton’s Andy ‘The Assassin’ Ingram, who like Wadi is unbeaten as a professional, but perhaps more importantly beat former British Cruiserweight Champion, and upcoming British title challenger, Shane McPhilbin in his debut bout. Wadi. who has wins over Moses Matovu, Rolandas Cesna, Igor Borucha and Paul Morris appeared unfazed by his opponents major scalp, as following one of his final training sessions - under the watchful eyes of Manager/Coach Bryan Lawrence at the TRAD TKO Boxing Gym in Canning Town - he said. Yeah I’m really looking forward to it so much, it’s good that I’m being busy and I’ve already got my fifth fight coming up and it’s going to be a fantastic win. We’re both unbeaten, so someone’s 0 is gonna go, it wont be mine though. I’m still doing the basic work, you know, keep popping that jab followed by flurry shots. I’m still keeping it to the gameplan, keeping all behind the southpaw jab so they don’t know when the left hand comes over the top. Good stuff. The sparring down here at the TRAD TKO has been excellent, been sparring a couple of the Cruiserweights we’ve got down here in the gym and also a Heavyweight that’s been pushing me, putting me into all awkward positions. I’ve been handling it really well. 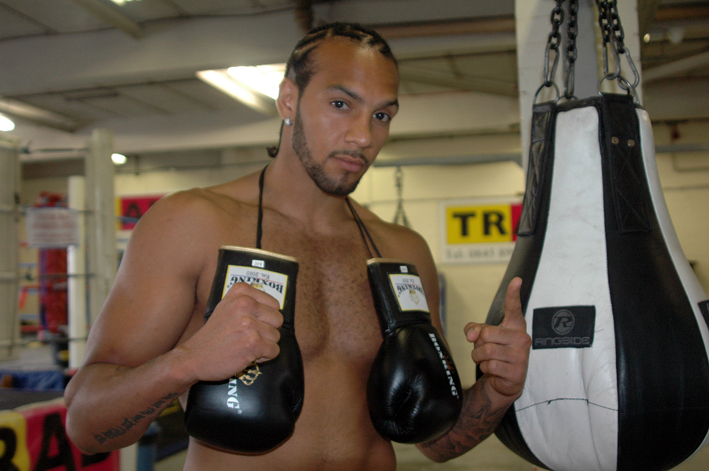 I carry some massive power which helps when you sparring a big Heavyweight that comes in at over eighteen stone. It’s going to be a great show, Just from the TRAD TKO we’ve got Erick ‘The Eagle’ Ochieng, who will be defending his English title and Danny Connor will be fighting for the Southern Area title. We’ve got a great team boxing out of the TRAD TKO, it’s a big family, yeah we just work hard, all go running. I know Erick is lighter but have to keep up with him, which brings my fitness level up as well. Personally the way Erick is looking now, he’s really lean, sharp, strong as well I think once he defends this now I think he should start moving onto bigger and better things. If Danny wins the Southern Area that will be wicked, I know he’s got the Masters title at the moment but him going for the Southern Area is fantastic. I know he trains really hard and for him to achieve that and bring yet another title to the TRAD TKO would be wicked as well. I definitely want to focus on my goal and bring a title back here in the future, I really want a Lonsdale Belt around my waist, but my gong for the British title is a little way off yet so hopefully I’ll get the chance to fight for the Southern Area title sometime next year, which is what I want. You know, win the Southern Area, defend it a couple of times and then move on to the British. Right now though I’m concentrating on this fight coming up, Andy Ingram’s unbeaten also so I need to really be on my game. I’m going to do the business on him and then move on. Wadi ‘Machoman’ Camacho versus Andy Ingram will be one of the supporting bouts for Lee ‘Lights Out’ Purdy as he challenges Gumersindo Lucas Carrasco for the vacant IBF International Welterweight title at Alexandra Palace on Saturday 8th September 2012. Co-Headlining Purdy-Carrasco on the Matchroom Sport promoted event is Tony Bellew versus Edison Miranda for the vacant WBC International Light Heavyweight title. Rounding out the main feature fights is another of Wadi’s TRAD TKO gym mate, British Masters Champion Danny ‘Cassius’ Connor who takes on Chris ‘The Flash’ Evangelou for the vacant Southern Area Light Welterweight title. Unbeaten duo John Ryder (11(6)-0) and Ryan Taylor (5(2)-0-1) will both be action against yet to be named opponents. Last but not least, former Team GB stalwarts Martin J Ward and Iain Weaver will be making their professional debuts, against yet to be named opponents. Tickets, priced £40 (Standard seated), £60 (Ringside) and £120 (VIP) for the Matchroom Sport promoted London Calling at Alexandra Palace on Friday the 8th of September 2012 are available on-line at www.tkoboxoffice.com or in person from the TRAD TKO Boxing Gym, Gillian House, Stephenson Street, Canning Town, London E16 4SA.